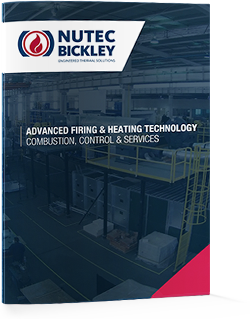 The design of the equipment used in Nutec Bickley’s Tundish Preheaters integrates the following concepts in order to make state of the art equipment. Use of nozzles that create gas recirculation and allow for a uniform drying of the load and a more efficient heat transfer by convection. Combustions system with individual burner ignition system which tallies for a line of gas per burner with a fine tuning valve, atomizing air, a diesel line for quick fuel exchange and a solenoid shut off valve. Hydraulic movement for the lid. Process control using a control panel equipped with a safety system against flame failure. Combustion Train meets with NFPA-86.